September, MONDAY, 12, 1864. rode all day &. got into Atlanta about 5 Pm. disposed of the prisoners &. came to the Regt. recd. a letter from Warren Ha[ll?] TUESDAY, 13. wrote a letter to Albert &. sent for a box rec'd. 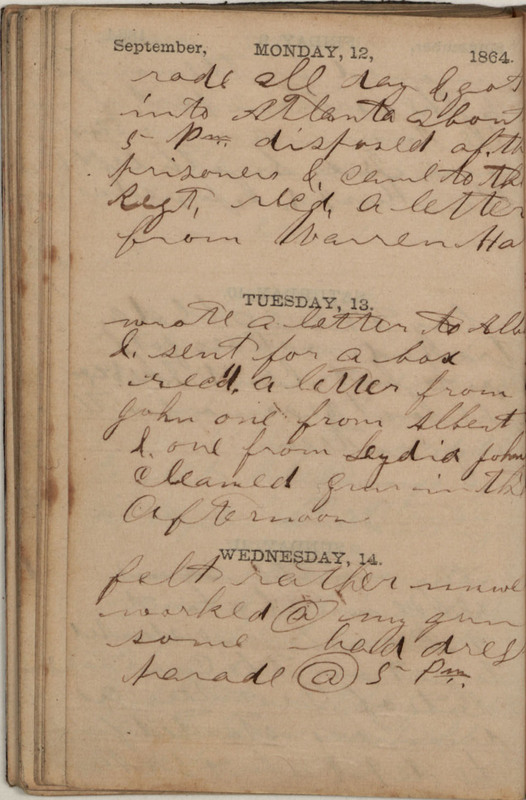 a letter from John one from Albert &.one from Lydia John Cleaned gun in the Afternoon WEDNESDAY, 14. felt rather unwell worked @ my gun some had dress parade @ 5 Pm..